Review: A story of history’s greatest manhunt for the world’s most dangerous man named Osama bin Laden. I didn’t enjoy this as much as I thought I would. Slightly disappointed. I felt that Jessica Chastain didn’t really have much of a part. She didn’t really feature as much as I thought she would. It is also a very long film. It is about two and a half hours. There could have easily been half an hour taken out. Not very enjoyable. 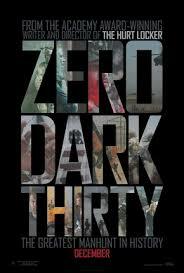 “Zero Dark Thirty” in military terms means 12:30 AM. James Cameron was originally going to direct this film but declined. In 2013 this won one Oscar and that was for Best Achievement in Sound Editing. This also won one Golden Globe Award also in 2013 and that was for Best Performance by an Actress in a Motion Picture – Drama.